Coverage: Live on BBC Red Button, live streaming and daily text commentary on BBC Sport website, updates on BBC Radio 5 Live plus second week commentary on BBC 5 Live Sports Extra. TV coverage on Eurosport. Third seed Venus Williams became the first big name to exit the French Open with a 6-0 6-4 defeat by Agnes Szavay. Williams, a seven-time Grand Slam winner, has now fallen at the third round in each of the last three years. Szavay, the 29th seed from Hungary, stormed through the first set and then edged out Williams in the second to set up a meeting with Dominika Cibulkova. Top seed Dinara Safina beat Anastasia Pavlyuchenkova 6-2 6-0 and Ana Ivanovic overcame Iveta Benesova 6-0 6-2. Maria Sharapova is also into the last 16 after coming through 1-6 6-3 6-4 against Yaroslava Shvedova of Kazakhstan. Former world number one Sharapova, a semi-finalist in 2007, has won all three of her matches this week in three sets and goes on to play 25th seed Li Na, a 7-5 6-1 victory over Olga Govortsova. Safina has dropped just four games all tournament and remains in contention for her first Grand Slam title. The 23-year-old dominated fellow Russian Pavlyuchenkova from the outset, breaking serve five times and saving the only break point she faced. Pavlyuchenkova was forced to chase shadows as Safina, the 2008 runner-up, produced one thumping groundstroke after the next and illustrated her much improved movement and positional sense. Standing between the world number one and a place in the quarter-finals is Aravane Rezai of France, who reached the fourth round for the first time with a 7-6 (7-3) 6-2 victory over 16-year-old Portuguese qualifier Michelle Larcher De Brito. I can't all of a sudden stop grunting - it won't feel natural because it feels like something's missing in my game if I stop. The match was not without controversy, however, as Rezai demanded the umpire intervene when her opponent's screaming reached ear-piercing volumes. "She really shouts loud," said the world number 57. "Maybe it's the way she tries to impress the opponent, but it upset me because it was unpleasant. "I told the umpire 'she's shouting too loud. There's a limit'. You can't shout that way. She said, '(Maria) Sharapova has never been told that she was shouting too loud'." Larcher De Brito shrieked when she hit the ball and when Rezai went long, also annoying the crowd by slamming her racquet after losing some points. The world number 132, who is the youngest player in the tournament, could be seen applauding the crowd in a sarcastic manner as she was booed off court. "She's actually the first one (to complain)," said Larcher De Brito. "I guess that was a bit of her tactic to throw me off a little bit. "When she did that, the crowd was on her side. Everybody supported her statement to the umpire. It threw me off a little bit, but I guess she has to find a way to win." Larcher De Brito is a graduate of the Nick Bolletieri academy which produced Sharapova and she lists Monica Seles, another noisy player, as one of her idols. "It's something that's been part of my game ever since I started," she added. "I can't all of a sudden stop grunting. It won't feel natural because it feels like something's missing in my game if I stop. "I'm 16 - I'm still learning. Maybe I can eventually put it under control but I hope not because it comes from Monica Seles, it comes from Sharapova, it comes from really great players." Reigning Wimbledon champion Williams was inferior to Szavay in every department and missed the opportunity to face 20th seed Cibulkova, who overcame Argentina's Gisela Dulko 6-4 6-2, for a place in the quarter-final. Szavay wrapped up the first set in just 30 minutes - yanking the 2002 runner-up from side to side and illustrating her impressive footwork at the net. Williams, playing her third match in as many days, gave herself a glimmer of hope by breaking the Hungarian's serve to lead 4-3 in the second set. But with the gusting wind playing havoc with her service throw-up, she lost the next three games and saw her hopes of a first title at Roland Garros ended for another year. "I had a tough day and I didn't get the ball in the court, which didn't help me at all," said Williams. "It was just, a day where they didn't go in. "It was a little difficult to recover from that first set - I'm used to beating people 6-0. I'm not used to my shots not going in and losing a set 6-0. So it completely was foreign ground for me." Defending champion Ivanovic is still yet to drop a set at this year's Roland Garros and has reached round four, where she will play either Victoria Azarenka or Carla Suarez Navarro, for the third successive year. Bad light suspended play on Court 1 of the match between Belarusian Azarenka and Navarro of Spain with the score at 5-7 7-5. 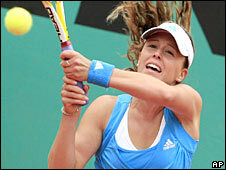 The eighth seed has conceded only five games since her hard-fought victory over Italy's Sara Errani in round one. She continues to wear protective strapping on the front of her right knee but showed no signs of injury as she battled through game one and then broke Bensova in games two, four and six. The pair traded early breaks in the second set but Ivanovic made the move in game six, grabbing her fifth break of the match to for 4-2 up and close in on victory, which she sealed with an unreturnable forehand. "The score doesn't indicate how hard I had to work for some points," said the Serb. "She started playing much, much better in the second set and started hitting the ball much heavier. "I feel fit and ready to handle any kind of opponent. My game is coming back and I feel more comfortable. These kind of matches help for the tough matches ahead in the second week."